View More In Dollhouse Accessories. 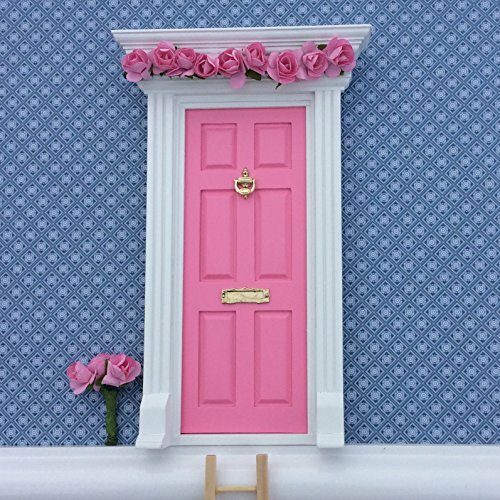 Fairy Door - Doll House Door Pink Vintage Rose *What you are buying: You are buying the door, embellished with a row of hand crafted paper roses, name plate, envelope and foam sticky fixings. You also get a mini posy of roses to sit by the door and a ladder, mat and pair of shoes. A very smart town housemagic door to allow fairies and magical friends to live in your home! It would be wrong to put an age limit on these magical doors. Far easier to say that it is a perfect gift for anyone with an imagination, who would like to share their home with fairies. ❤ YOU WILL LOVE THIS BECAUSE - Simply sit the door on or above your skirting board in the kitchen, bedroom, nursery or on the stairs or landing for the whole family to share - Once the door is installed, you need to write a little invitation on the notelet supplied: 'Dear Fairies, please come and live in my house. Your new home has a pink front door' love Emily. The next morning a fairy or magical friend will have moved in. - You can leave notes and little flowers at the door and you never know... you might even get a reply Note: the door only opens for fairies. *How to install the door: You can use the sticky fixers that the door comes with (they are re-useable so once you peel it off the packing, it should be fine to apply to the wall). Alternatively, you can use your own fixing material such as double sided sticky tape/peel and stick etc depending on your wall surface. *It is this big: Packaging: A4 Door: H21 x W 13cm Wooden Ladder: H x 10 cm Welcome Mat: L 7 x W 3.5 cm Shoes: L x 2cm (both shoes are moulded together) Magical Little World is one of the largest stockist of handmade fairy doors and accessories WARNING: This is not a toy. It is for decorative use only. All products in our magical collection contain very small parts and are a choking hazard. They are a danger to young children. If you have any questions about this product by Magical Little World, contact us by completing and submitting the form below. If you are looking for a specif part number, please include it with your message.